Find our web pieces, video series, album, radio syndicates and more at TheFinalEdition.com . Single pieces from The Final Edition Radio Hour. 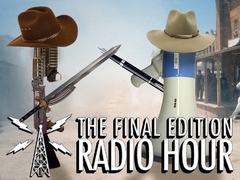 The Final Edition Radio Hour: 30 minutes of sizzling satire in the tradition of National Lampoon, Spinal Tap, Spy Magazine and South Park. Satire With Teeth. Lets put guns in the hands of the Americans that need them the most. We got Hilary, Herpes, the Marathon and an Interview with an Infiltrator. What do you got? And we feel fine. I mean, we're all gonna die. But we're okay with that. A heartwarming full-time Lesbian Psychic on the street ... what do you think? And Family Dinner and Donald Trump. Once again, the California crew takes over and drives The Final Edition off a cliff. A Cliff Of Funny, that is. Drugs, Terrorists, Stock Prices, Presidential Polls & British Pigs… Everything was up and down this month. (Well, for the pig, in and out). Episode 150: Too Much News! Miss America, a CVS checkout nightmare, Muslim clocks, Planned Parenthood & more of the Presidential candidates from hell. Depression, Politics, Burning Man, and Stock Market Crashes. Good times?